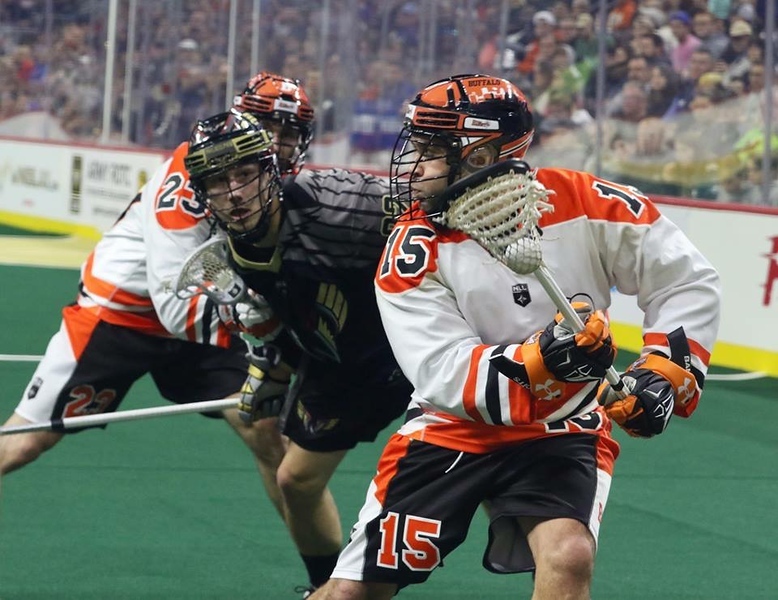 A four-goal run late in the fourth quarter helped the Buffalo Bandits edge the Philadelphia Wings on Saturday night at KeyBank Center 14-10. The win ends a 3-1 four-game home stand for the Bandits, who’ll play back-to-back road games next weekend. Their overall record improves to 4-1, tying them for first place in the East division with the Toronto Rock. Head coach John Tavares told bandits.com that the win shows how much the Bandits have improved since last season. Scoring in the fourth quarter was exactly what Buffalo needed. Despite having an early 7-1 lead and going into halftime up 8-4, Philadelphia dominated the third quarter, scoring four goals and cutting the lead to 9-8 by the end of the quarter and eventually tying the game at nine in the fourth. However, the Bandits were prepared for the Wings. And take it back they did. After trading a goal with Philadelphia to make it 10 all, Shawn Evans, at that point held to just one assist, gave Buffalo the momentum they needed and put them ahead 11-10. Evans dodged out from behind the net and, facing towards his own goal at the other end of the floor, put a low backwards shot past Davide DiRuscio. Evans added second goal later. Dhane Smith and Thomas Hoggarth also scored to push the lead to 14-10. Smith discussed how the team, especially he and Evans, were able to get over the struggle in the third. Even though Smith only had two goals, he ended the game as the leading point-getter with six assists for a total of eight points. Not far behind him was Small, with his six, and Hoggarth with two goals and two assists. Next Saturday the Bandits visit the Rochester Knighthawks, who Buffalo beat two weeks ago. There will be little time for rest as they travel to Connecticut to face the New England Black Wolves the next day.